"ASTROLOGICAL REMEDIAL MEASURES FOR STRENGTHENING PLANETS"
This stone is of dark green color and bright and is used for strengthening the planet Mercury. Mercury rules analytical faculties, speech, sharp intellect, power of discrimination and confidence. Mercury is personified as a prince, thinker and knowledgeable in the field of mathematics, denotes advisory roles, business, engineering and related fields, research scholars, communicator, editors, authors, accountants, lawyers, experts in analytical works, software engineers, auditors, intellectuals, transporters, publishers, salesman, traders, etc. When weak and/or afflicted it causes psychic diseases, nervous breakdown, leucoderma, impotence, vertigo, deafness, asthma and diseases of respiratory canal and intestines, insomnia, etc. Its complexion is grass green. Mercury is weak quite frequently. Whenever its period is in operation in any nativity it creates tensions in life, lack of confidence, situation of indecisiveness, etc., which ultimately leads to faulty decisions. The effect is more if Mercury is weak in the natal chart as well as in transit at the time of operation of its sub periods. It makes a person a nervous wreck and can even cause paralysis when closely afflicted by Rahu-Ketu axis, if the ascendant and its lord are also weak or the sign Virgo falls in the ascendant. 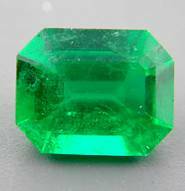 The strength to Mercury is provided by wearing of an emerald whose recommended weight is between 4.6 to 4.7 carats. The stone may contain some silky inclusions but it should not contain feathers and black spots. It is very necessary that one wears this stone in an auspiciously elected time.